Sylvia Dyer Turnage has donated copies of her new book Georgia's Pioneer Aviator, Micajah Clark Dyer to the Micajah Clark Dyer Foundation. Proceeds from sales go to raise funds for Foundation projects. The book is very informative about Clark Dyer and his inventions. 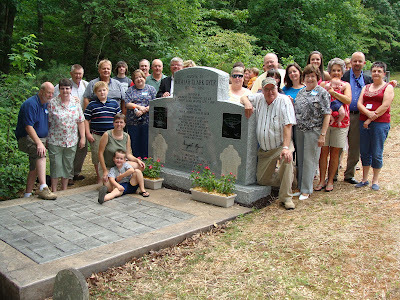 Family members gather around the Micajah Clark Dyer memorial with Bob Barton of WNC Marble & Granite Works who made the monument from granite manufactured by Eagle Granite Co. of Elberton, Ga.
A monument memorializing Clark Dyer’s invention and flight was dedicated at a special program held in the Choestoe Baptist Church Fellowship Hall on July 17, 2010. The program featured a pictorial and oral presentation of the life and accomplishments of Clark Dyer to a gathering of many descendents, some of whom heard this important historical account for the first time. Andrew Turnage, President of the Micajah Clark Dyer Foundation, discussed the important features of Clark’s craft, which clearly distinguished it from the designs of other flying machine designs in the mid and late 1800s. Following the program, some of the family members caravanned to the Old Choestoe Church Cemetery where Clark and his wife were interred in 1891 and 1892, respectively, to view the newly erected monument which features two drawings from Clark’s patent and incorporates the original, hand-carved tombstones of Clark and his wife. Plans are being developed by the Foundation for other monuments to be erected in the future to honor Clark as an inventor who places well ahead of others in his design of a navigable airship. Also, efforts continue to get Clark inducted into the Georgia Museum of Aviation’s Hall of Fame and to build a replica of his aircraft. John Clark of Georgia News Network with Micajah Clark Dyer’s great-great-granddaughter, Sylvia Dyer Turnage, and her son, Andrew Turnage at the Georgia Focus interview. “Georgia Focus” a weekly, 28-minute talk show program featuring conversations about matters of statewide importance will air an interview with Sylvia Dyer Turnage and Andrew Turnage conducted by John Clark about the importance of Micajah Clark Dyer to Georgia history on July 10th and 11th . 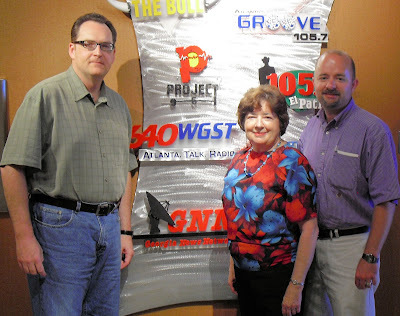 The program will be carried on 98 radio stations that comprise the Georgia News Network. Find your GNN affiliate and local air time for Georgia Focus (Adobe PDF file). Download the Georgia Focus broadcast (10.42MB MP3 large file) used with permission from Georgia News Network. Mr. Clark found the facts about the invention to be interesting and surprising, not having previously heard the account of the events that occurred in the remote North Georgia mountains in the 1870s which validate the occurrence of manned flight in the U.S. more than a quarter of a century earlier than the widely accepted date. 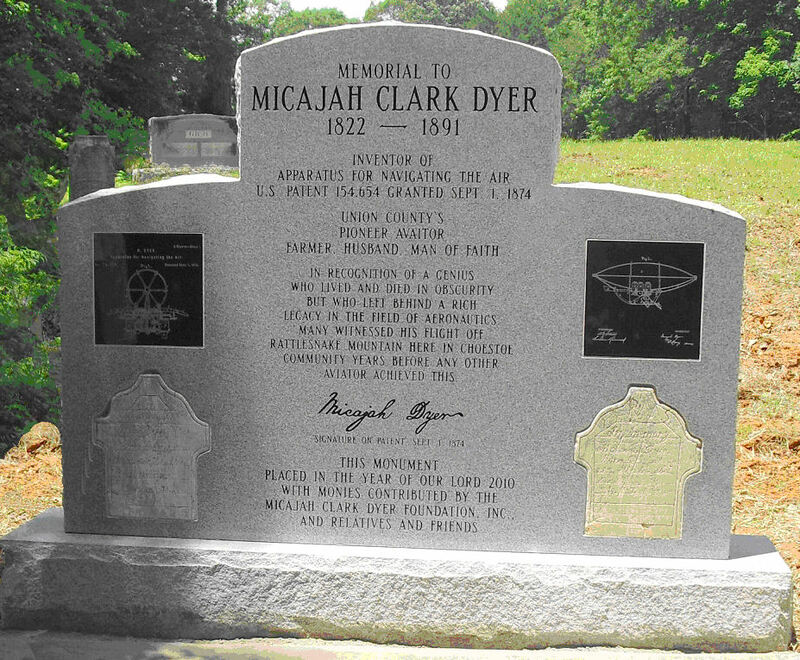 The monument memorializing Clark Dyer’s invention and flight is now in place and ready for a family dedication ceremony that will take place in connection with the Dyer-Souther Family Reunion on Saturday, July 17th. A special program will be held in the Fellowship Hall at 1:30 p.m. and will be followed by a walk (or drive) to the cemetery for a dedication. A formal, community-wide dedication open to the public is planned for later in the fall. As usual, the Dyer-Souther Reunion will be held at Choestoe Baptist Church Family Life Center on State Highway 180 East (the Micajah Clark Dyer Parkway), Blairsville, Ga.
June 15th was an exciting day as a boom-truck rolled up beside the Old Choestoe Baptist Church Cemetery and offloaded an eagerly awaited hunk of marble. It was the arrival of the new monument for Georgia’s pioneer aviation inventor, Micajah Clark Dyer. We are happy to say that the W.N.C. Marble & Granite Co. did a superb job of engraving the memorial and embedding the original gravestones of Clark and his wife, Morena, in the marble slab. The long overdue monument is a fitting tribute to the 1874 Union County inventor of an apparatus for navigating the air. 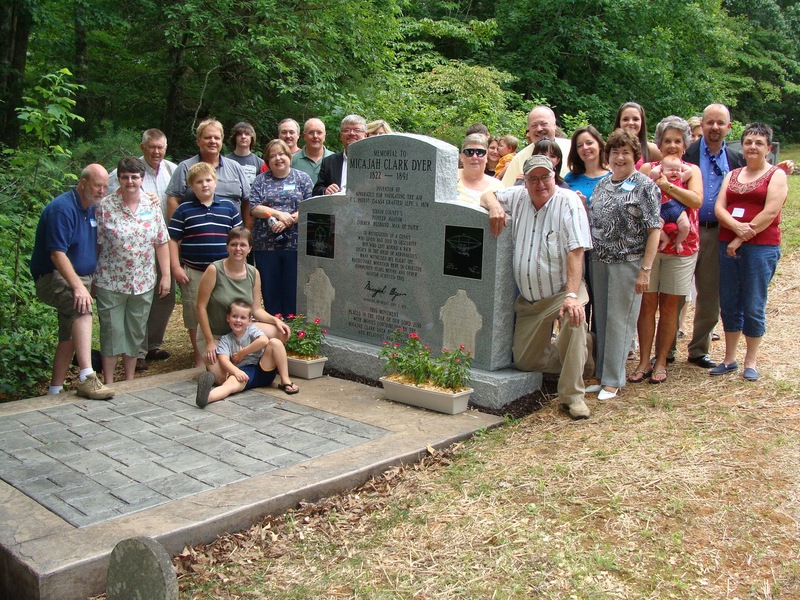 Dedication of the monument is planned for July 17th during the Dyer-Souther Family Reunion, which is held annually at Choestoe Baptist Church on State Highway 180 East (the Micajah Clark Dyer Parkway), Blairsville, Ga. Everyone is cordially invited to attend the dedication ceremony. The first installment payment has been made on the monument and the next one is due on July 1st. If you wish to contribute toward the next payment, you may send your donation to the Micajah Clark Dyer Foundation, 805 Low Gap Rd., Blairsville, Ga. 30512. Since the Foundation is a 501(c)(3) organization, contributions are tax-deductible and a receipt will be sent to you promptly. If you make a contribution by July 10th, your name will be placed on the dedication program as a donor. The program folder will be an attractive historic document that your family can treasure in the years to come.